It's another early morning on the ranch. You wake up and climb out of bed like any normal day, only to find the sun is already over the horizon.... Wait, the sun is already rising?... The clock shows 8 am! You should already be completing the day's chores by now. What happened to the rooster? You leave your house to check, but as soon as you step out, you see the devastation across the ranch. Overnight, a storm destroyed the ranch's fences and the animals fled! You must recover them. Hopefully they haven't gone too far. Now, you must set out to repair the fences and retrieve them from the nearby forest. 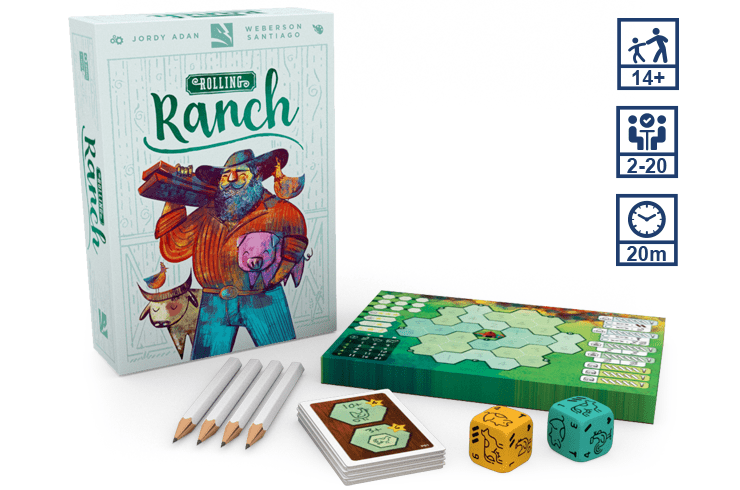 With a pencil and a Ranch Sheet, each round players use the results of a dice roll to rescue animals and improve their ranch. 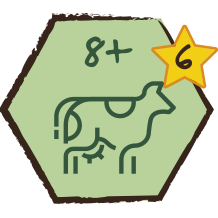 Each player attempts to place animals in their ranch the best way possible, and construct buildings to receive bonuses that will help them achieve the highest score. Everyone plays at the same time! Who will rescue the most animals and be the most successful rancher? 1. 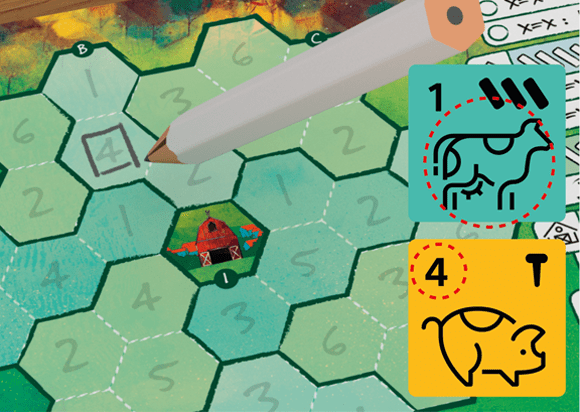 Rescue the animal shown on the BLUE die by drawing it in a hexagonal pen space on their Ranch Sheet matching the number shown on the YELLOW die. 2. 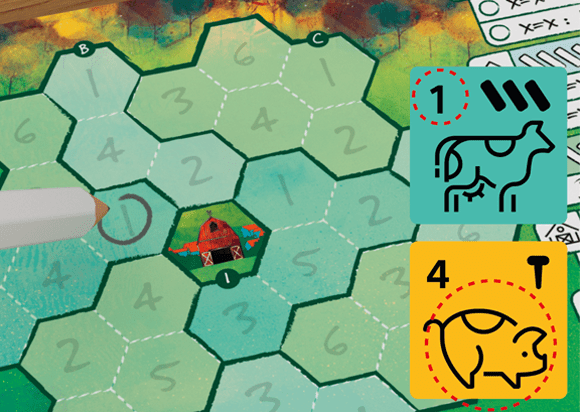 Rescue the animal shown on the YELLOW die by drawing it in a hexagonal pen space on their Ranch Sheet matching the number shown on the BLUE die. 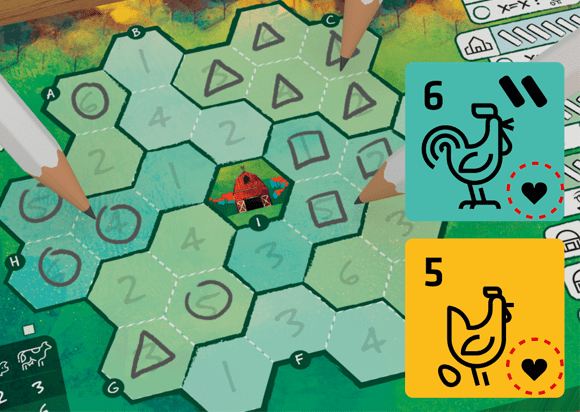 When drawing an animal in a pen space, players may choose to drawn simple shapes to represent animals on their Ranch Sheet (▽ = Chicken, ⭘ = Pig, ⃞ = Cow). After all players have performed an action, check for breeding. 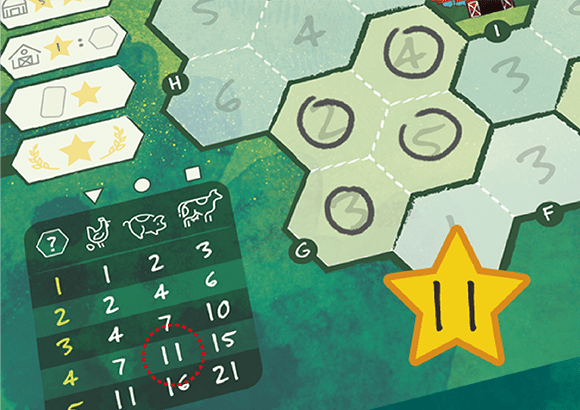 If both dice show a heart on the lower right corner, each pair of animals in the same pen will breed and players will be able to draw an additional animal of the same type in the pen. Start the next round by rolling both dice. 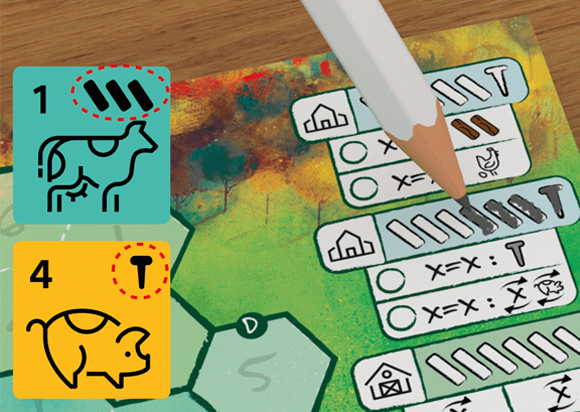 If the pen is filled with animals of the same type (ignoring buildings), the player counts the number of animals in the pen and checks the number of points awarded of that animal type on the table. If the pen is filled with animals of different types, score points equal to the number of animals in that pen. 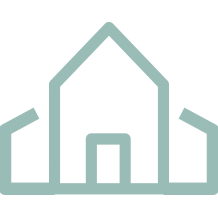 Rolling Ranch have three types of buildings. The Barn will give a boost during the game whenever two equal numbers appear on the dice. Like for example, getting a single material or a chicken in any hexagonal space desired. 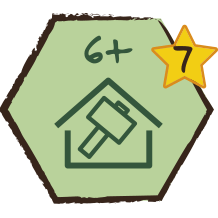 The Warehouse will give one shot abilities boost during the game and in addition, at the end of the game, each unused warehouse bonus will be worth 1 point. The Greenhouse will give 5/12/20 points at the end of the game depending on the number of greenhouses the player has built. At the beginning of the game, each player receives a secret Mission Card that provides a pair of unique objectives for the player to accomplish. If the player achieves the requirements of an objective, he receives the points shown on it. These are three of the fifteen missions included in the box. 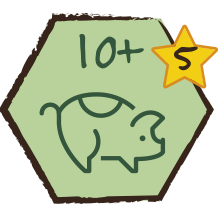 Have ten or more pigs on the player’s Ranch Sheet. Have eight or more cows on the player’s Ranch Sheet. Have six or more buildings on the player’s Ranch Sheet. The game ends at the end of the round in which one player has filled all the pen spaces on their Ranch Sheet. Players will count their points based on animals in both completed and uncompleted pens, buildings and mission cards. In case of a tie, the player who triggered the end of the game is the winner. If there is still a tie, the player with the most buildings is the winner. Otherwise, all tied players share the victory. To try Rolling Ranch you can download our print and play and use the web-app to roll the dice! 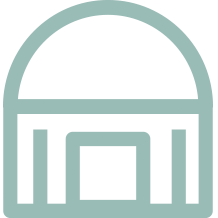 The digital versions for Tabletop Simulator and Tabletopia are coming soon! This looks really good! Can’t wait! For these roll and write games, I’m surprised they haven’t been provided a more sustainable alternative (e.g. dry erase marker and laminated boards). Has this been considered? The game looks very funny! Can’t wait for another amazing game from Thunder Gryph Games! Wow another thundergryph game ! Looks amazing. Can’t wait for the release! Looks simple to learn and teach, but varied enough to stay interesting! Love the look of the dice and so happy this will have a way to play solo! I love this theme and the idea of assymetric players! Sweet looking games. I’ve backed Tang already. I looks like a funny game to play!! the dices are so cute! Looks great I’ll take this game!!! I’m looking forward to adding this to my board game collection because I don’t usually play roll and write games. Looking forward to trying this on TTS! Love to admire all your beautiful games next month in Essen! The pack of three look spectacular — and I love the art style. love the art! my wife will flip for chicken dice! 20 players’ game looks crazy! Oooo this looks so good!! Looks like a fun party game! Looking forward! I love the beautiful design of your games. Looking forward! Looks Great! The only small criticism: Why isn’t it Dry Erase Boards? Otherwise i’m looking forward to Essen to give this a Go! Could you also provide objective cards in the pnp files, please? Dry erase boards would be nice but that adds extra cost. People can laminate the paper sheets on their own; that’s what I do with all my roll and write games. Can’t wait to play this one! We know that every event is of utmost importance for each client. 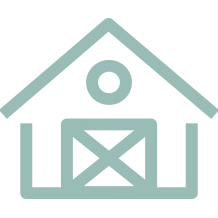 Whether it is a business meeting, conference, quinceanera, or wedding, our goal is to make every moment at Rolling 7’s Ranch exceed our clients’ expectations. What are the dimensions of the 20 cards? I would like to buy sleeves for this game.